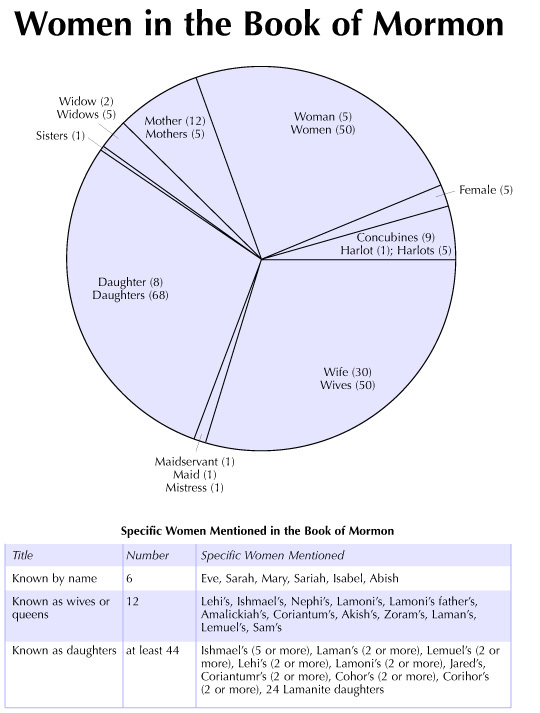 Although women do not receive prominent attention in all parts of the Book of Mormon, they are referred to more often than most readers realize. Six are mentioned by name (Eve, Sarah, Mary, Sariah, Isabel, Abish); others are known by title (such as Ishmael's daughters, King Lamoni's wife, or Morianton's maidservant). Many more women are recognized collectively, primarily in their roles as wives, mothers, and daughters, but also as sisters, maids, and widows. Women are also mentioned frequently as members of numerous groups, multitudes, cities, or general populations. Only two women (Isabel and the daughter of Jared) are seen explicitly in negative roles; most others (notably the twenty-four Lamanite daughters and the mothers of Helaman's stripling warriors) are seen as strong, righteous individuals. The totals on this chart do not include pronoun references or metaphorical allusions to women.